Dr Janis Kluge is a Senior Associate in the Eastern Europe and Eurasia Division at SWP. To keep public budgets stable, the Russian government is forced to raise taxes and extend the retirement age in the years to come. There is a widen­ing gap in funds required to cover the paternalistic social policies of earlier years. At the same time, the struggle for control of public resources is having a destabilizing effect on the political regime – especially in light of the ever more pressing question of Putin’s successor in the Kremlin. Up to the presidential election of 2018, the Russian leadership avoided making any budget cuts that would have hurt key clientele groups: retirees and the military-industrial complex. Additional income was generated in­stead through a series of smaller budgetary adjustments. Shortly after the start of Putin’s fourth term, however, tax raises and a higher retirement age were announced, which lead to drastic declines in the president’s approval ratings. As a reaction to shrinking funds, budget policy is now being controlled in a more centralized way by Moscow, while public oversight of government budgets has been restricted. Shadow budgets have also emerged outside the purview of the finance administration. In this complex and politically tense situation, conflicts between elites are erupting with increasing frequency, bearing risks for Putin’s fourth term in office. 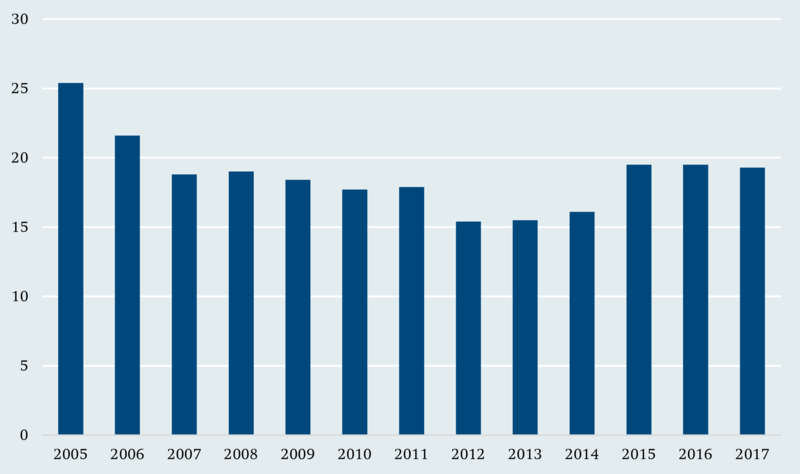 Russian budget revenues relative to GDP have de­clined substantially over the last decade. The lower oil price is one reason for this, but tax revenues out­side the energy sector have fallen as well. The Russian economy has been in a period of stagnation for a num­ber of years now, placing a burden on state cof­fers. The government reserves that the Kremlin was still able to fall back on prior to the 2009 financial crisis have been largely exhausted in 2015 and 2016, and economic growth is expected to be slow after 2018. The Russian leadership faces ongoing financial difficulties in the years ahead, making unpopular policies such as increasing the value added tax and raising the retirement age necessary. At the same time, the domestic political situation has become more difficult for the Kremlin to manage. Without economic growth, the Russian leadership will no longer be able to fulfill its implicit “social con­tract” with the population. As long as the standard of living was rising, the vast majority of Russian citizens refrained from active participation in politics. But then from 2014 to 2017, real incomes fell for four years running. The Kremlin could now be facing a crisis of legitimacy – and that in a phase of uncertain­ty about a possible shift of power after Putin’s last term of office (2018–2024). Will the Russian regime be able to adapt to the changing economic reality, or will dwindling re­sources lead to a destabilization of the political sys­tem? How is the Kremlin dealing with the increasing pressure to implement economic reforms? Are any practical ways to escape the budgetary dependence on oil revenues beginning to emerge, or will the risks increase further in the years to come? 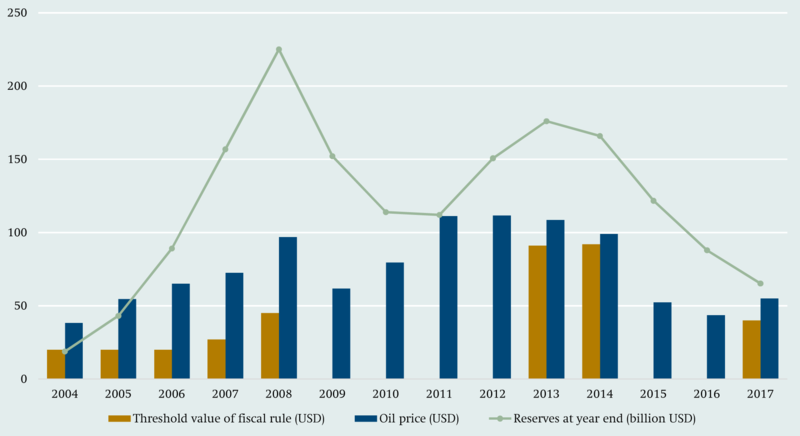 After the oil price collapse of 2014 put the state budget under pressure, the Kremlin pursued policies aimed at maintaining the existing political and eco­nomic order. Rather than undertaking important but risky reform projects in the run-up to the 2018 presi­dential election, the leadership in Moscow sought to mobilize remaining reserves in the system by im­plementing a series of smaller budget and tax adjust­ments. In doing so, it sought to keep the financial and political risks resulting from budgetary policy in check. This changed with Putin’s inauguration, shortly after which tax increases and a higher retire­ment age were announced, which have led to drastic declines in the president’s approval ratings. To increase revenues at the height of the economic crisis in 2016, the Russian government sold shares in the oil companies Bashneft and Rosneft but without relinquishing control over them. The state pension system discontinued capital accumulation so that all premiums could be used to cover the pay-as-you-go pensions. Russia’s commitment to oil output cuts, in line with the November 2016 resolution of the Organi­zation of the Petroleum Exporting Countries (OPEC), was also aimed at increasing revenues with­out engaging in structural reform within the country. On the spending side, Russia’s leadership has distinguished between politically risky and less risky areas. It has passed early and significant budget cuts in policy areas that did not affect the Kremlin’s core voters and supporters – areas like education, the economy (infrastructure), and health spending on the federal level. Pensions, social security, and defense, on the other hand, have long been spared from budget cuts. Only when the 2016 budget crisis reached dangerous proportions did the Russian government decide to reduce pension inflation adjustments and eventually also raise the retirement age. The Kremlin’s approach to military spending was similarly cautious: Decisions on a long-term state armament program were delayed repeatedly and finally made in fall of 2017, only after the oil price had recovered to some extent. The increased pressure on the government budget has exacerbated conflicts over the distribution of fi­nan­cial resources, heightening the importance of con­trol over the remaining funds. This has led, among other things, to a centralization and personalization of decision-making power over budgetary funds in the Kremlin. Other political actors like the State Duma have not played a significant role in the budget process for years now. The already low scope of action available to regional government administrations has been curtailed further in recent times. The Russian leadership is not only further weaken­ing the Russian federalist system through centralization, but also undermining the binding nature of budgetary planning itself. Budget plans have become more opaque and unspecific, and resources that lie outside the Finance Ministry’s purview have increas­ed. The big state-owned enterprises play an important role in this: they only pay part of their profits into the state’s budget, and in return, they take on direct political responsibilities in Russia and abroad. Public control over government resources is thus being gradually eroded and the directors of the state-owned enterprises are becoming influential political figures with their own agendas. From the perspective of Germany and the EU, the vulnerability of Russia’s government budgets has important political implications. In a situation of declining government revenues, the Russian regime will have a difficult time legitimizing its rule by point­ing to economic successes or instituting com­prehensive social programs. The regime’s annexation of Crimea in 2014 garnered high approval ratings in 2015 and 2016 despite the economic slump. If a loss of legitimacy becomes an imminent threat, the Rus­sian leadership could be tempted to build on this experience. The result would be a stronger emphasis on mobilizing patriotic sentiment and intensifying anti-Western propaganda. An improvement in rela­tions between the EU and Russia would then be pushed off into the more distant future. A more prolonged budget crisis or a serious de­-stabilization of the Russian regime could also have severe immediate impacts on the EU. For Germany, it would pose risks to the energy supply and to the security of foreign direct investments in Russia. Politi­cal destabilization in Moscow would also quickly spread to neighboring countries with close economic ties to Russia. Unresolved conflicts in the region could then spin out of control. 2016. The average oil price in 2016 was $41.9.7 Against the backdrop of a renewed increase in oil prices in 2017 (to an average of $53.3), the deficit fell to 1.4 percent of GDP. Budget planning figures were used for the years 2018–2020. At the end of May 2018, a new budget bill was introduced in the Russian Duma taking the sharply increased oil price from 2018 into account. As a result of this, revenues are 1.8 percent of GDP higher, and instead of a deficit of 1.3% percent of GDP, a surplus of 0.5 percent of GDP is expected, Gosudarstvennaya Duma Federal’nogo Sobranija Rossijskoj Federacii, Zakonoproekt № 476242-7 [draft law no. 476242-7], 29 May 2018, http://sozd.parliament.gov.ru/bill/476242-7. The decline in non-oil revenues in the remaining budget balance up to 2014 was disguised by the boom in commodity prices. It only became evident in the non-oil deficit, an indicator published by the Russian Finance Ministry for the Russian budget’s oil depend­ence. This budget deficit is hypothetical: tax revenues from oil and gas have been deducted from it. 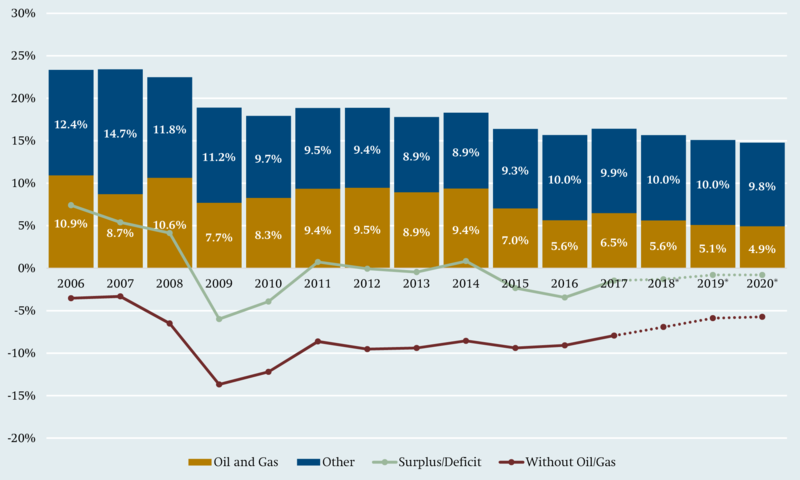 For 2007, the non-oil deficit was still 3.3 percent of GDP; since the financial crisis, the budget deficit would have been between 9 and 10 percent of GDP without oil and gas revenues in most years. Economic growth is unlikely to ease budgetary strain in the years to come. https://esa.un.org/unpd/wpp/ (accessed 5 May 2018). a “Minfin Rossii ne stanet forsirovat’ vypusk evrobondov iz-za sankcij SŠA” [Russia’s Finance Ministry will not force the issu­ance of eurobonds due to US sanctions], in: Vedomosti, 18 De­cember 2017, https://www.vedomosti.ru/finance/news/2017/ 12/18/745646-minfin-rossii-ne-stanet-forsirovat-vipusk-evrobondov-iz-za-sanktsii-ssha (accessed 26 January 2018). 20180501.xlsx (all accessed 8 June 2018). c Danil Sedlov and Julija Titova, “Vozhidanii sankcij. Kak amerikancy mogut obrushit’ rubl’” [In expectation of sanctions. How the Americans could cause the ruble to collapse], Forbes, 21 November 2017, http://www.forbes.ru/finansy-i-investicii/353045-v-ozhidanii-sankciy-kak-amerikancy-mogut-obrushit-rubl (accessed 2 February 2018). d Tat’yana Lomskaya, “Centrobank minimal’no snizit stavku iz-za ugrozy novych sankcij” [Central Bank reduces prime interest rate minimally due to the danger of new sanctions], Vedomosti, 14 December 2017, https://www.vedomosti.ru/ economics/articles/2017/12/14/745198-tsentrobank-snizit-stavku (accessed 2 February 2018)..
e For 10-year government bonds denominated in rubles (OFZ). f Erik Wasson/Saleha Mohsin, “Treasury Warns of Upheaval If U.S. Sanctions Russian Debt”, Bloomberg.com, 2 February 2018, https://www.bloomberg.com/amp/news/articles/2018-02-02/treasury-warns-of-widespread-effects-of-russian-debt-sanctions (accessed 5 February 2018). g Ibid. ; Sedlov and Titova, “Vozhidanii sankcij” (see note c). It would be short-sighted to attribute Russia’s budget difficulties solely to the surprisingly sharp drop in the oil price. The budget will continue to fluctuate between deficit and surplus with the ups and downs in energy prices in the future. Long-term budget fore­casts predict, however, that the surpluses will occur less often, and that the deficits will be deeper. As the financial room to manoeuver diminishes, the Russian government is forced to raise taxes and make people work longer into old age. In comparable calculations, the World Bank estimates that Russian public debt could increase to 116 percent of GDP by 2050, although as much as 250 percent is possible depending on how productivity, demographics, and the oil price develop.25 The tax rates and pension levels assumed in these studies have already changed since Putin’s fourth term began in 2018. The studies do, however, clearly reveal what a comfortable situation the Russian treasury has en­joyed for the last 20 years. As the financial room to manoeuver continues to diminish due to demographic developments, the Russian government is being forced to raise taxes and make people work longer into old age. Demographic change is a burden on budgets because it comes with a declining rate of employment, which causes government expenditures, espe­cially within the pension system, to increase. 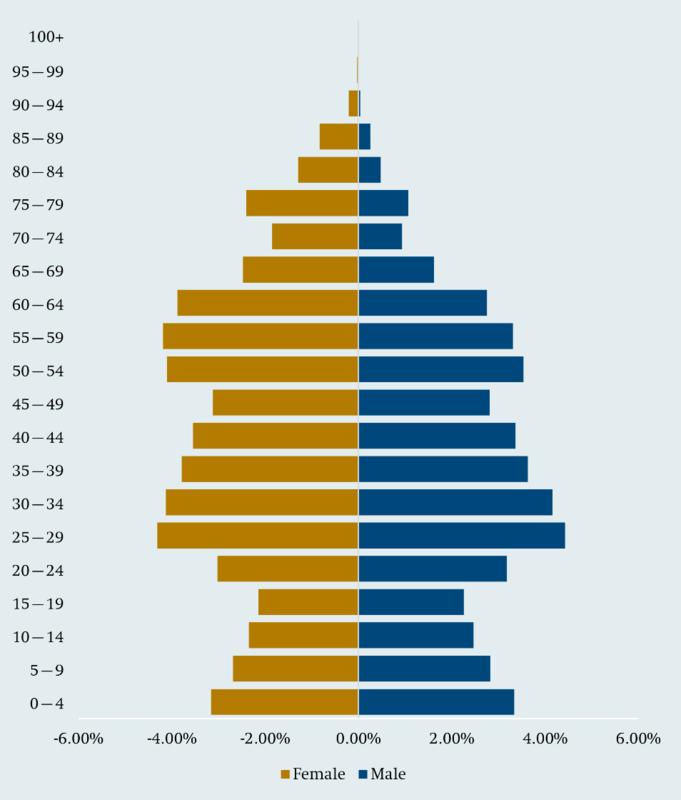 Russia’s cumulative additional spending on pensions because of demographic change alone is estimated by the IMF to reach 97.9 percent of GDP by 2050.26 A similar level of reserves (instead of the close to 5 percent in the Russian welfare funds in 2018) would be required to counterbalance the impacts of demographic change on the current tax system up to 2050. The reason for the negative forecasts is not just Russia’s demographic development, but also the predicted stagnation of oil and gas production. The World Bank expects annual oil production in Russia to fall from 547.5 million tons in 2016 to 436 million tons by 2050. At the same time, gas production is ex­pected to increase slightly, causing Russian the value of overall energy production to remain at 2017 levels up to 2050. It is problematic for Russia that such an impor­tant economic sector – one that was responsible for over half of Russian exports in 2017 – is predicted to show no growth. For countries that face significant demographic challenges, the solution typically cen­ters around “growing out” of the expected burdens. The dominance of resource exports is thus a stumbling block on the path out of future debt. Source: Evgeny Goryunov, Lawrence Kotlikoff and Sergey Sinelnikov-Murylev, “The Fiscal Gap. An Estimate for Russia”, Russian Journal of Economics 1, no. 3 (2015): 254.
of 2017, but this was only partially invested in liquid assets (2.3 trillion rubles, or €35 billion) and thus could only partially be used to cover future deficits.29 Although the welfare fund was designed to provide long-term protection for the pension system, some of the funds were used for high-risk financing of state-owned businesses and infrastructural projects such as the 2014 Winter Olympics in Sochi. The partial mis­use and low volume of the reserve funds show the monumental political difficulties the government in Moscow is facing when it comes to sustainable management of Russia’s resource wealth. Source: IMF, Fiscal Monitor, October 2013. Taxing Times (Washington, D.C., October 2013). As of early 2018, Russia has a new fiscal rule in place, again with a low oil price of just $40 as its thresh­old value. Budget plans for the years 2018 to 2020 are based on annual oil and gas revenues of only around 5 percent of GDP. The oil price in fact rose to over $60 at the end of 2017 and to around $70 in 2018, so revenues should be higher than estimated. Whether or not the Russian government will exercise the necessary fiscal discipline remains questionable in view of the short lifespan of past fiscal rules. When a country exports a large amount of its (finite) resources, a fiscal rule can be used to establish that only a portion of the revenues will be used and the rest will be saved. This ensures that future generations will also profit from the country’s resource wealth and isolates the government budget to some extent from major commodity price fluctuations. Fis­cal rules can help to reduce negative effects of commodity exports on other economic sectors, known in economic jargon as the “Dutch disease”. Government reserves are generally invested in low-risk foreign securities such as US or European government bonds. This prevents currency appreciation in boom periods and protects reserves from depreciation in times of crisis. If the fiscal rule is followed closely, pro-cyclical fiscal policy – that is, a fiscal policy that intensifies cyclical economic effects – becomes less likely, and the financial and political risks of fluctuating commodity prices sink. Comparative studies show, however, that fiscal rules are only effective in the long term under specific institutional conditions.b In Norway, for in­stance, an independent parliament, independent courts of law, and political competition would make it very difficult for the government to weaken its fiscal rule. In Russia, in contrast, there is no entity that could protect the fiscal rule from a change of priorities in the Kremlin. a Christian Kastrop, Gisela Meister-Scheufelen, Margaretha Sudhof and Werner Ebert, “Konzept und Herausforderungen der Schuldenbremse” [Concept and challenges of the debt brake], Aus Politik und Zeitgeschichte 62, no. 13 (2012), http:// www.bpb.de/apuz/126016/konzept-und-herausforderungen-der-schuldenbremse?p=all (accessed 9 March 2018). b IMF, The Commodities Roller Coaster. A Fiscal Framework for Uncertain Times (Washington, D.C., October 2015), 8, http:// www.imf.org/en/Publications/FM/Issues/2016/12/31/The-Commodities-Roller-Coaster (accessed 11 August 2017). Budget imbalances in recent years have significantly increased pressure on the Russian government for reforms. A second or third “2016” with oil prices around $40 could make it necessary to implement austerity measures, which would further threaten the regime’s popularity. The Finance Ministry attempted to increase federal revenues through a series of smaller adjustments. Part of the losses in oil revenues were absorbed in this way, but the majority of measures implemented are not sufficient to increase tax revenues on a long-term basis. Either they could only be implemented once (privatization) or they increased current tax rev­enues at the expense of future budget years (pensions, corporate income taxes). The redistribution of regional revenues will not ease the federal budget in the long term because Moscow will ultimately have to take the responsibility for regional debt. Before the tax and retirement age adjustment announced in 2018, the biggest adjustments were planned on the expenditure side. General govern­ ment spending in 2017, 35.2 percent of GDP, was un­affected by the fall in the oil price to 2014 levels (34.9 percent). The federal portion thereof fell slightly from 18.7 percent to 17.8 percent. Significantly more radi­cal steps are planned for the years to come: the budget adopted at the end of 2017 for the period 2018–2020 envisions a reduction in federal spending to 15.6 percent of GDP. Looking at the spending categories in detail, the political sensitivity of these planned cuts becomes apparent: Two thirds of budget cuts are planned in the categories of defense (planned cuts of 17.6 per­cent)39 and social policy (16 percent) – areas in which virtually no cuts have been achieved up to 2017. Spending cuts in both of these areas are risky for the Russian leadership since they will affect the Kremlin’s most important supporters. Under President Vladimir Putin, social policy and the defense sector were devel­oped with the explicit aim of bolstering the regime’s legitimacy. Yet these sectors contribute little to Rus­sian economic growth. The question of whether the Russian regime will succeed with its spending adjust­ments or whether a long-term destabilization of gov­ernment finances is imminent will be determined above all in these two policy areas. According to the 2018–2020 budget plan, the largest budget cuts relative to 2017 measured in percentage of GDP will be in the area of social policy. Including regional budgets and extrabudgetary funds, a decline of 2.1 percent of GDP is planned up to 2020, including a 1.0 percent of GDP cut in the federal budget’s social spending. payments. This budget item does not provide a com­plete picture of all of the Russian government’s social policy activities, however. Some measures that are designed to protect socially or economically disad­vantaged segments of the population are financed through other budget categories such as health and education. Source: Rosstat, Neravenstvo i bednost’ [inequality and poverty], http://www.gks.ru/wps/wcm/connect/rosstat_main/rosstat/ru/ statistics/population/poverty/# (accessed 2 February 2018). In Russia, over 80 percent of fiscal redistribution of income is achieved through pensions. This helps to attenuate the inequality in market incomes, which is extremely high by international comparison.41 Never­theless, 20 million Russians live in poverty according to official Russian statistics. Economic growth in the 2000s and rapidly rising pensions in the period that followed caused the poverty rate to decline. Starting in 2014 with the economic crisis, poverty increased again. Pension levels are low by international com­parison, at just 36 percent of average income. The majority of social transfers in Russia also do not go to the poorest sectors of the population but are dis­tributed in a relatively indiscriminate way across income groups. This can be seen, for instance, in the basic pension: As a component of monthly pension payments, the basic pension is intended to guarantee a minimum level of social security. Pension rates are therefore differentiated into various categories of pension recipients or degrees of need. An evaluation of population census data from 2012 showed how badly this system is working: Only 20 percent of basic pensions paid ended up with the 20 percent poorest pension recipients.42 The unsystematic distribution of these funds means that the Russian government has to pay more than other countries for social policy in order to achieve a comparable reduction in inequality. Overall, despite low pensions, pensioners in Russia are a net beneficiary of government redistribution. The legally guaranteed minimum pension is oriented toward a subsistence level of income calculated spe­cifically for pensioners (as of 2017: 8500 rubles per month, or €129), which is slightly below the general poverty threshold (10,300 rubles per month, or €157). The proportion of pensioners living in poverty is, at 12.2 percent, below their proportion in the total popu­lation (21.6 percent). The losers in this “hori­zontal” redistribution across different demographic groups are families and adults living alone, who make up an overproportional percentage of the poor population. Redistribution from rich to poor (“vertical redistribution”) scarcely takes place at all through the Russian government’s tax and social policy. This change is considered to have been triggered by the wave of protests that engulfed all of Russia in the summer of 2004. The demonstrations were against what is known as the “monetization of privilege” (mone­tisaziya lgot). The government wanted to elimi­nate special benefits for specific population groups like retirees and veterans (free use of public transport, free medications, health resort stays, etc.) and replace them with means-tested financial benefits. The pro­tests soon led to the formulation of new political demands and focused increasingly on President Putin himself.52 The trust rating in the Russian president, a polling statistic compiled by the Levada Center, an independent public opinion research institute, reached a new low in 2005 at 38 percent.53 The demon­strations showed the extremely high willingness of pension recipients to mobilize politically. As oil prices rose, the pension system increasingly became an instrument for the redistribution of windfall tax revenues. The Kremlin reacted quickly: In Putin’s April 2005 speech before the Russian Federal Assembly, he declared social policy to be the most important task facing all levels of government. The government drafted a series of development programs with a sig­nificantly different focus from previous liberal-ori­ent­ed reform plans. New transfers and benefits were intro­duced without the requirement of thorough means-testing. The “maternity capital” incentive – a one-time payment of the equivalent of €17,000 (purchasing power parity in the year the incentive was intro­duced) to mothers on their child’s third birthday – became the government’s showpiece, symbolizing the new direction of its social policies. The large volume of pension payments and social benefits posed a particular risk to Russian budget stability: One the one hand, falling oil prices reduced government revenues, which are needed to finance transfers. An added challenge was that spending on social policy increased during the oil price slump. Since the dropping oil price meant that the ruble declined in value as well, imported consumer goods in Russia became more expensive, and consumer goods prices rose overall.57 Pension and social benefit recipients in Russia are legally guaranteed adjustment of their benefits for inflation. Due to this “scissors effect”, with revenues and expenditures moving in opposite direction, social policy spending exacerbates the Russian budget’s dependence on oil. While the government kept rising social policy ex­penditures in check by not following through with inflation adjustments, it was still not addressing fundamental problems such as the lack of focus in benefit provision and the looming risks of demographic change. One possible way to resolve the “informal sector dilemma” in the pension system would be an ap­proach in which individuals receive a portion of their pensions through a funded pension system. Employees who report their income officially and whose employers make payroll social security contributions could then be rewarded accordingly. If contributors have trust in the pension system, a similar effect could be achieved through a pay-as-you-go scheme. Trust is very low in Russia, however, and has declined further due to the incomplete inflation adjustment of 2016 and the “freezing” of the previously existing funded pension scheme. A funded pillar was first introduced into the Rus­sian pension system as part of the liberal reforms of 2002. Of the individual’s pension contribution, which is currently 22 percent of gross wages, 6 percent was set aside in the name of the contributor for future pension benefits. In 2014, however, this fund was frozen, which means that the contributions are not continuing to accumulate but are being diverted to cover ongoing pension payments. This helped to reduce transfers from the federal budget into the pension system. The savings are estimated at 342 billion rubles (€5.2 billion) for 2016 auf, 412 billion rubles (€6.3 billion) for 2017, and 471 billion rubles (€7.1 billion) for 2018 (0.4–0.5 percent of GDP).60 The decision to freeze accumulated individual pen­sion savings has been extended multiple times already. There is currently no indication that the funded pillar will be reactivated, even in the draft budgets for the years up to 2020.61 A return to a sys­tem in which pensioners are required to build up their own individual pension reserves is thus not likely. The burdens to the pension system are being hidden and shifted into the future. Although the budget deficit is declining, “implicit debt” is increasing. In the context of the economic crisis and declining tax revenues, the Russian leadership has had few simple options for action in the field of social policy. The Kremlin had to choose between unpopular reforms and budget cuts that would jeopardize politi­cal support from important voter groups, and a more debt-financed social policy that would increase me­dium- to long-term budget risks. The middle course it decided to take is beset by both political and fiscal risks, but most likely poses no immediate danger to political stability. Procrastination on unpopular reforms and the increase in implicit debt that is not covered in the budget figures create new fiscal risks. The population’s trust in the pension system – a key precondition for future reforms – has suffered from the gov­ernment’s efforts at short-term budget savings. The 2017 defense budget was 3.1 percent of GDP (€43.3 billion). Defense expenditures, which are paid almost completely out of the federal budget, varied widely in recent years, reaching a new peak at 4.4 percent of GDP in 2016. In 2011, the defense budget was just 2.5 percent of GDP. 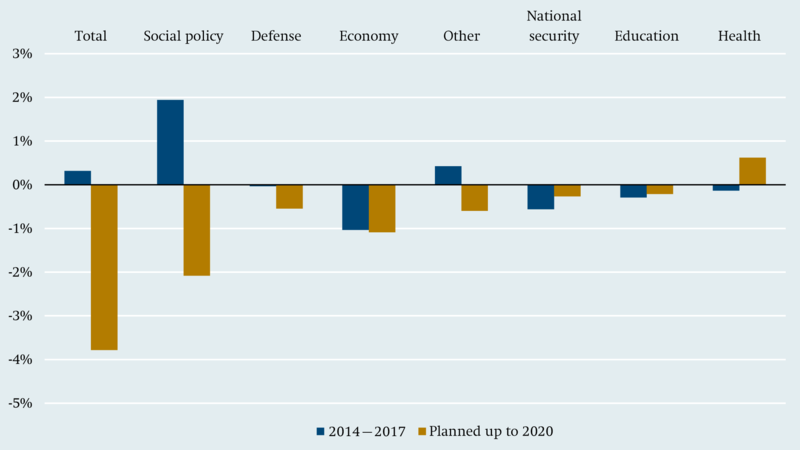 The budgets project that defense expenditures up to 2020 will decline to 2.6 per­cent of GDP. Russia is spending more on the military than its defense budget would suggest, however. Just three quarters of Russian military expenditures, classified according to the definition of the Stockholm Inter­national Peace Research Institute (SIPRI),65 actually come out of the defense budget. The rest, amounting to another 1 percent of GDP (€13.8 billion) in 2017, are paid for out of other budget categories such as social policy (military pensions), education, and health. professional army.68 But armaments account for most of the increase in military spending. * Figures from the 2018–2020 budgets were used. Sources: Defense budget: Minfin Rossii, Finansovo-ėkonomicheskie pokazateli Rossijskoj Federacii [Financial and economic indicators of the Russian Federation], https://www.minfin.ru/ru/statistics/; Military and arms spending: Julian Cooper, Prospects for Military Spending in Russia in 2017 and Beyond (Birmingham, 2017), https://www.birmingham.ac.uk/Documents/college-social-sciences/government-society/crees/working-papers/prospects-for-military-spending-in-Russia-in-2017-and-beyond.pdf (accessed 2 October 2017). The process of planning the follow-up program (GPV-2025) indicates that the tense budget situation has at least temporarily dampened the Kremlin’s arms ambitions. The new strategy for the years 2018–2027 includes spending in the amount of 19 trillion rubles (€288 billion). In nominal terms, it is similar in volume to the predecessor program, GPV-2020. As a percentage of GDP, the scope of the new arms program is just half of that (20.6 percent of GDP in the year of the program’s adoption, 2017). According to estimates, the direct costs of Russian military operations in Syria and Ukraine make up just a few percent of the Russian defense budget, which amounted to around €43.3 billion in 2017. The neces­sary expenditures could thus be covered entirely through reallocations, for instance from the budget for military exercises, without any added burden on the budget. a Yabloko, Rossija potratila na Siriju ot 188.6 do 194.3 mlrd rublej [Russia spent 188.6 to 194.3 billion rubles on Syria], 2017, http://www.yabloko.ru/news/2017/09/22 (accessed 8 June 2018). b Ilya Yashin and Olga Shorina (eds. ), Putin.War. Based on Materials from Boris Nemtsov (Moscow, May 2015), http:// 4freerussia.org/putin.war/Putin.War-Eng.pdf (accessed 3 October 2017). c Reva Bhalla, “The Logic and Risks Behind Russia’s Statelet Sponsorship”, Stratfor, September 2015, https://www.stratfor. com/weekly/logic-and-risks-behind-russias-statelet-sponsor ship (accessed 24 June 2017). 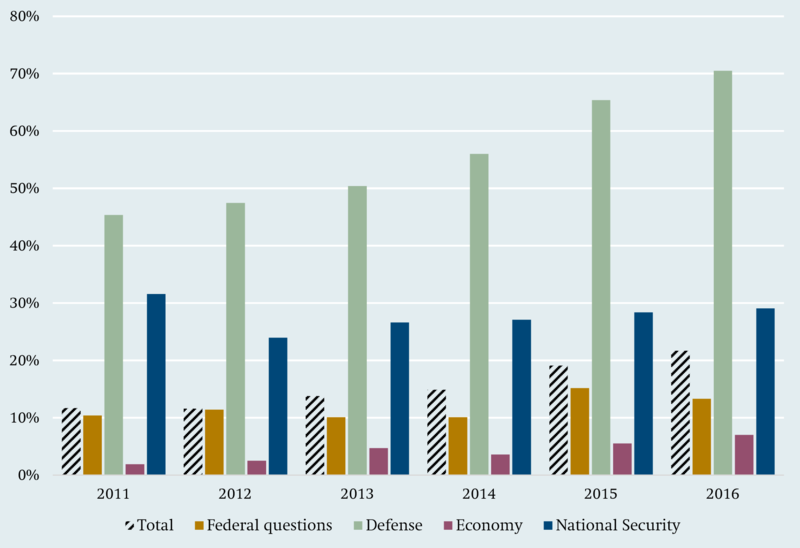 The defense budget grew to a record high in 2016 with no direct connection to the preceding escalation of foreign policy crises in Ukraine and Syria. 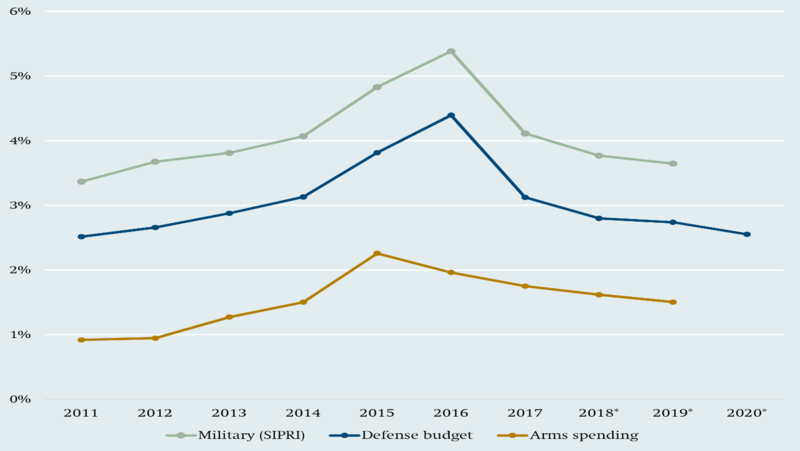 In contrast to the long-term armament programs, the change in defense spending from year to year does not necessarily indicate a change in the Krem­lin’s priorities. From the outset, the GPV-2020 envi­sioned a more dramatic increase in arms spending in the second half of the program period.73 The partially inconsistent trajectory of spending from 2011 on was also due to the mode of financing military spending: armaments industries had received government guar­antees for loans in the amount of around 1.2 trillion rubles (€18 billion) to start fulfilling arms contracts immediately.74 These guarantees are not contained in the defense expenditures in the early years. Starting in 2016, the Finance Ministry ended the practice of using bank loans to provide co-financing, and paid off the majority of the loans (793 billion rubles, or €12 billion). A further repayment took place in 2017 (approx. 200 billion rubles, or €3 billion). These pay­ments caused the defense budget to reach a record high for a period of 2016, with no direct connection to the preceding escalation of foreign policy crises in the Ukraine conflict and in Syria. The Kremlin’s security policy priorities only partially explain the increase in spending on long-term Rus­sian arms programs. The systematic implementation of the wide-ranging GPV-2020 is also rooted in a par­ticular constellation of domestic and industrial policy factors. In the public discourse, the drastic increase in arms spending has often been justified with indus­trial policy arguments. Vladimir Putin likes to present the defense industry as an engine of growth for the Rus­sian economy, although economists cast doubt on the industry’s ability to play this role. In many cities, however, arms manufacturers are among the most important and in some cases the only major employers. As a result, they play a highly significant socio-economic role. According to the data from the Ministry of Industry, arms industry production more than doubled be­tween 2010 and 2016.78 The share of civilian pro­duc­tion in the arms industry fell during the period from 33 percent (2011) to 16 percent (2015).79 The companies are largely oriented toward the Russian defense ministry as their main buyer. The Russian defense industry is being squeezed by high-tech western companies on the one side and cheaper Chinese manufacturers on the other. It is unlikely that there will be a rapid change of course from the rearmament that has been pursued up to now. During the budget crisis of 2015 and 2016, the Russian leadership showed willingness to limit military spending. Yet even if the political will to do so could be maintained despite the recent rise in oil prices, the drastic cuts planned by the Finance Minis­try would be difficult to implement for structural reasons. First of all, actors from the arms industry and military have a great deal of political weight in the decision-making process. In the last few years, for instance, they have repeatedly succeeded in having defense spending levels revised upward after budgets were passed. The growing foreign policy tensions between Russia and NATO are strengthening forces within the Kremlin that focus on security policy arguments. Second, due to sanctions, demographic developments, and increasing competition, the arms industry will have to battle increasing headwinds in the years to come. A significant decline in government arms contracts would have a severe impact on arms producers and could destabilize the socio-eco­nomic situation in a number of cities. Ultimately, whether or not the planned budget reductions succeed will depend on arms producers’ flexibility – and this has been relatively low up to now. One can safely assume that the Kremlin will not allow these companies to fail, risking mass unemployment in many of Russia’s monotowns. A newly established bank serving the arms industry and pos­sible cross-subsidies from other state corporations will continue even if arms spending falls. This will create new risks that could materialize in future budgets, for instance, if borrowers default on loans from Promsvyazbank. The future of arms and social policy spending plays a central role in the Russian (expert) discourse on reform plans. On explicit instructions from the Krem­lin, two reform proposals were developed starting in 2016: On the one hand, there is the proposal by a team at the Center for Strategic Research, headed by the economist and former Minister of Finance Alexei Kudrin. On the other hand, there is the “strategy of growth” developed by the Stolypin Club, now under the leadership of Russian businessman and Presidential Commissioner for Entrepreneurs’ Rights Boris Titov.89 Whereas Kudrin’s perspective on Russian eco­nomic policy is based more on neoclassical, supply-side economics, Titov’s strategy is clearly rooted in the Keynesian, demand-oriented tradition. Kudrin’s plans are much more strongly rooted in current eco­nomic literature. The two sides are in agreement on the urgent need for reform of the legal system as a precondition for better protection of property rights. On questions of budget policy, however, the two strategies take opposing positions. Kudrin proposes a redistribution of fiscal spending within the budget (“fiscal manoeuver”). He distin­guishes between expenditures in productive areas (such as education, health, and infrastructure), which have a positive impact on economic growth, and expenditures in unproductive areas, which have little or even a negative impact on growth (military and security).90 In the category of expenditures with a negative impact, Kudrin includes social transfers that do not reach the needy population they are targeted at but are instead distributed indiscriminately (these are not taken into consideration in the following statistical analysis, however, due to the lack of data). a The long-term negative effect of infrastructural spending is explained by the fact that many projects are not geared toward economic needs. This is true, for instance, of the megaprojects carried out in recent years (Olympic Games, Soccer World Cup, and Kerch Bridge). An empirical analysis by Alexei Kudrin and Alexander Knobel shows that expenditures on health and infra­structure in Russia lead to a disproportionate increase in GDP (1.25 percent and 1.64 percent, respectively, for every 1 percent of GDP increase in expenditures), while defense spending increases GDP little (0.22 per­cent, see Table 2). Defense expenditures are even detri­mental to long-term growth, while educational spending in particular leads to positive growth effects. The authors of the Stolypin Club’s alternative pro­posal call for a substantially more expansive mone­tary policy on the part of the central bank to promote private investment. At the same time, pointing to unused production capacities in Russia, they recom­mend boosting domestic demand through an increase in government spending to generate increased eco­nomic growth.93 Their plan aims to achieve long-term budget equilibrium not through spending cuts but through the increase in tax revenues resulting from economic growth. Titov pairs his Keynesian perspective with a developmental state approach: According to this idea, active industrial policy and ongoing im­port substitution will lead to the emergence of lead­ing international enterprises in a variety of techno­logical sectors. Titov and his colleagues expect that the defense industry will make a positive contribution to growth, and warn against a decrease in de­fense spending.94 Overall the Stolypin Club’s ap­proach is less systematic in its design and more eclec­tic than Kudrin’s research-based recommendations. The Kremlin has shown no clear preference for either of the plans. After a presentation of the two reform papers, Putin suggested that a joint strategy be devel­oped combining both concepts.95 In view of the con­tra­dictions between a number of the recommendations, this would be virtually impossible to carry out. Overall, the reaction on the part of the Russian lead­er­ship reveals a certain level of disinterest in the proposals for structural change. Economic know-how and reform concepts can be found predominantly among the “liberals” within the Russian elite, who still hold important positions in the central bank, the Finance Ministry, and the government-owned Sberbank. In those contexts, how­ever, they operate purely as technocrats and have only a limited scope of action. As political actors, the liberals are just as discredited in Russia as liberal political ideas themselves. This is due in part to the regime’s propaganda campaign dissociating it from the period of radical liberalization of the government and the economy in the 1990s. For the liberally in­clined elite, the annexation of Crimea and the esca­lation of foreign policy confrontation with the West meant even further weakening of their position in the domestic political landscape. Instruments of long-term voluntary commitment, such as budget plans and fiscal rules, require a minimum level of transparency and separation of powers to amount to more than just good intentions. Sustainable fiscal policy in Russia is inhibited by problems of expenditure control. Instruments of long-term self-commitment such as budget plans and fiscal rules require a minimum level of transparency and separation of powers to amount to more than just good intentions. In reaction to the collapse of tax rev­enues, however, control over budget funds became more centralized and less transparent. Some of the revenues also do not make it into budgets but remain with state-owned enterprises. This increases their political clout, and since they are profiteers of the status quo, they have no interest in a reform of Rus­sian economic policy. By granting the parliament budgetary powers, the Rus­sian constitution gives the State Duma and the Federation Council an effective instrument for shap­ing public policy. In past years, however, Russia’s parliament has barely made use of this fundamental right in the sense set out in the constitution. After the acrimonious budget debates of the 1990s, which often ended in protracted impasses and delayed budget reso­lutions, there have been no further disputes between parliament and the executive since the early 2000s. In the Duma today, half as much time is spent discussing budget laws as in the early 2000s. The num­ber of changes made during the readings in the Duma have declined continuously as well.97 As a result, budget planning has become very predictable. In addition to a functioning separation of powers, transparency of planned expenditures is generally seen as a key precondition for public control of national budgets. At the same time, an increase in transparency without checks and balances may also be a sign of strengthening authoritarian control over the use of resources in various areas of the government administrative apparatus and may thus enable the centralization of power. Russia has been scoring high for several years in international comparisons of public budget trans­parency. In a ranking by the independent Institute of International Budget Partnership, Russia is on par with Germany.106 For its ranking, the organization evaluates what data is published by the government and whether the point in time of publication theo­ retically enables societal budget control. It takes into account in its ranking reports from the Accounts Chamber of Russia, and the formal legal independence of this agency from the executive branch. Source: Gaidar Institute, Russian Economy in 2016. Trends and Outlooks (Moscow, 2017). The Russian case reveals the methodological limits of transparency rankings that are based on formal cri­teria. The Russian Ministry of Finance does not have to respond to objections from the Accounts Chamber, and it is by no means obligated to make improve­ments to budgets. Given the largely state-controlled media landscape, the reports published by the Ac­counts Chamber cannot generate any political pres­sure from the public at large. The transparency rank­ing also does not take into account what portion of the budget is considered classified information for reasons of national security. The Russian Finance Ministry occasionally seeks advice from international organizations to professionalize expenditure planning. 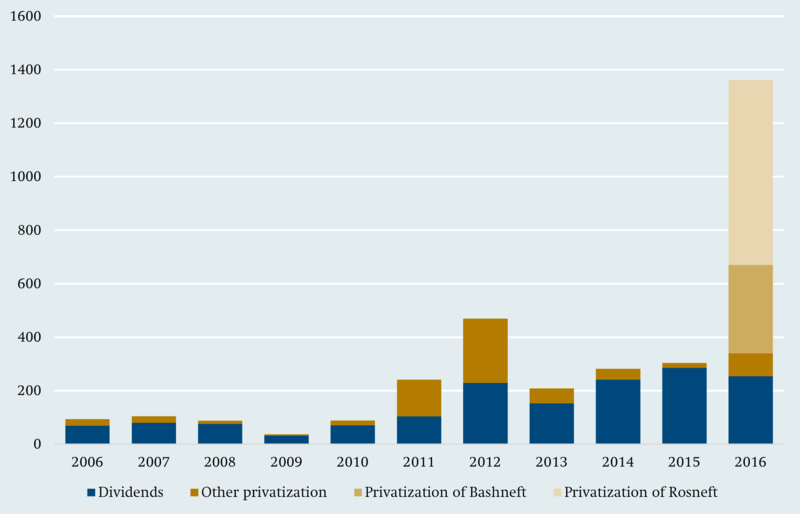 State-owned enterprises in Russia serve as an impor­tant source of budget revenues from tax payments, dividends, and proceeds from privatization. In 2016 the government’s partial sale of its own shares in the oil companies Bashneft and Rosneft significantly reduced the looming budget deficit. At the same time, state-owned enterprises are being used directly by the Russian leadership to achieve their political aims. This dual role has impeded reforms of the sector and has created a breeding ground for conflicts within the Russian elite. The Russian government controls numerous com­panies. Their annual expenditures make up an esti­mated 29–30 percent of Russian GDP.114 Most of these are what are known as unitary enterprises, which are controlled directly by the federal, regional, and local government administrations. Well known exam­ples include the Russian Post, Mosfilm film studio, and the Moscow Metro. A second group of government-owned enterprises are joint stock companies, which are partially privately owned and listed on for­eign stock exchanges. These include the two largest Rus­sian state firms in the energy sector, Gazprom and Ros­neft, Russia’s pipeline monopoly Transneft, the state-owned Sberbank and VTB Bank, and service providers like the airline Aeroflot or Rostelecom. A third, very particular type of state-owned enterprise can be best compared to foundations: state corporations, which include the defense and industrial hold­ing conglomerate Rostec and the development bank Vnescheconombank (VEB), are effectively owned by themselves. Whereas unitary enterprises have limited power to make decisions without the agreement of the respect­tive government level, joint stock companies and state corporations have much greater formal inde­pend­ence. The Russian President appoints and dis­misses the managing directors of state corporations, and thus holds the strongest influence over them.115 Thanks to Vladimir Putin’s personal relationships to the corporate executives, the Kremlin has the possi­bility to exercise relative direct control and influence, independent of company structure. Putin has a shared history at KGB in Dresden with Sergey Chemezov and Nikolay Tokarev, chief executives of the state corpo­ration Rostec and oil pipeline company Transneft. The CEO of Rosneft, Igor Sechin, has been working at Putin’s side since the early 1990s. The transparency of state-owned enterprises is determined by their legal form and whether they are listed on international capital markets. Open joint stock companies listed on foreign markets are subject to the strictest regulation and outside auditing. State corporations, in contrast, are not subject to regular outside audits of their activities.116 Since they are not legally under state ownership, their revenues do not flow into the budget.117 Unitary enterprises and joint stock companies are less privileged: part of their prof­its have to be paid into the budget (in particular, stock companies’ dividends). They also provide budget financing when they are either fully (relatively rare) or partially (more frequent) privatized. The leadership of state-owned joint stock companies prefer to keep their profits and reinvest according to their own priorities. The average amount of dividends paid by state joint stock companies to the budget is low by international comparison.118 The Finance Min­ istry therefore receives significantly less as re­turns on equity from the shares in state joint stock companies than what it has to spend on its own financing through sovereign bonds. This means an implicit “dividend sub­sidy” to state companies – independent of tax ben­efits and other forms of subsidies – in the amount of 386 billion rubles in 2015 and 346 billion rubles in 2016 (€5.9 and €5.2 billion, respectively). The Finance Ministry has been working for several years to impose the same rules for dividends on all state-owned joint stock companies. This has been un­successful to date, however, due to exemptions that some companies have secured with support from the Kremlin. bor’bu za dividendy goskompanij” [Finance ministry continues battle over dividends from state-owned companies], Vedomosti, 10 July 2017, https://www.vedomosti.ru/economics/articles/2017/07/10/717277-minfin-dividendi (accessed 3 January 2018). A clear pattern emerges in the distribution of dividends: In the past, the three companies Gazprom, Rosneft, and Transneft fulfilled numerous political functions for the Kremlin, among other things in the construction of oil and gas pipelines and management of energy exports, in the nationalization of the media landscape (especially by Gazprom Media), or in providing financial support for public infrastructure projects or foreign allies.121 In the case of these com­panies, the Russian leadership is less interested in having profits flow into the federal budget, since it can directly and informally influence how they are used in the companies themselves. This also means that the directors of these companies are themselves powerful figures who have no interest in reforming the public sector. Sechin had initially left his post at the head of Rosneft in 2011 under pressure from then President Medvedev. With Putin’s return to the Kremlin, Sechin took over leadership of the company again. Since Sechin’s return, Rosneftegaz has changed its dividend payout policy and only passes on part of the dividends it receives from Rosneft, Gazprom, and other shareholdings to the federal budget, leaving the ma­jor­ity of these profits in the accounts of Rosneftegaz. Through Igor Sechin, the Russian President has access to funds from Rosneftegaz to address economic and social problems that the Kremlin considers urgent. The government’s informal control over these busi­nesses also bears risks, however, because it gives those at the helm of the companies (such as Igor Sechin) personal political clout. Not just the dividend policy but also privatizations bear substantial poten­tial for conflict: the lucrative and influential position of the corporate managers close to the Kremlin is under threat when state-owned enterprises pass over into private ownership. This partially explains why budget revenues from privatization in Russia have been significantly lower than revenues from dividends over the last few years. The year 2016 was an exception because of two par­ticu­larly large privatization projects. Without the sales of shares in the oil companies Bashneft (330 bil­lion rubles, €5 billion) and Rosneft (692 billion rubles, €10.5 billion), the federal budget deficit would not have been 3.4 percent but 4.6 percent of GDP. The Bashneft shares were renationalized in 2014. Previous to that, the mineral oil company had been majority-owned by the private holding Sistema, head­ed by Russian businessman Vladimir Yevtushenkov. The sale of shares to Rosneft that followed this in 2016 can­not be considered as privatization in the strict sense, because the shares in Bashneft went from the state agency Rosimushchestvo to state-owned Rosneft. Bashneft is thus still state-controlled but is now part of the company headed by Igor Sechin. The sale of Bashneft to Rosneft was preceded by disputes over whether such pseudo-privatizations make sense. Former Minister of Economic Development Alexey Ulyukaev and the former head of Ros­neft Board of Directors, Andrey Belousov,131 expressed criticism. They argued that the sales of one state-owned enterprise to another does not create additional budget revenues in the long term. Igor Sechin ulti­mately kept the upper hand, however, and was able to integrate Bashneft into Rosneft. The formal justifi­cation for the transaction was – as in the preceding discussion around dividend policy – that Rosneft was not a state-owned corporation in the narrow sense, as it was controlled by Rosneftegaz. It was the first time in the history of post-Soviet Russia that a Federal Minister was jailed. Reform-oriented politicians like Alexei Kudrin must have understood Ulyukayev’s sentence as a signal to those “systemic liberals” still in the government not to interfere in the business of state-owned enterprises. Kudrin, who called the Ulyukayev sentence “terrible and unjustified”, had proposed a far-reaching pri­vatization of state-owned enterprises himself in summer of 2017.133 Whether the political leadership actually wanted to send that kind of signal is unclear. The case does make it clear, however, what risks the personalized control of public resources entails for the internal stability of the political system and its capacity to undergo reforms. A decade of economic stagnation and the oil price slump have largely exhausted the Russian Finance Ministry’s reserves. With recovering energy prices, they are now only being replenished slowly. However, Russia’s public debt remains low. As a result, even though the Russian leadership did not carry out struc­tural reforms after the economic crisis, the financial stability of Russia’s government budget is not in immediate danger. The Kremlin’s fiscally conservative stance may at first seem to promote stability. In recent years, the political leadership has succeeded in maintaining the status quo by further centralizing formal authority over political and economic decisions and by institut­ing informal controls, particularly in the case of the major state-owned enterprises. This form of crisis management promotes some processes, however, that could prove to be problematic in the long term, both for domestic policy as well as for Russia’s relationship to Germany and the EU. Moscow’s handling of the fiscal pressures in 2015 and 2016 shows that Russian authoritarianism is becom­ing even less transparent and simultaneously more centralized. The concentration of economic and political power in the hands of Vladimir Putin and his immediate circle will exacerbate the risks to sta­bility for the regime in the years to come, since ac­cording to the constitution, the Russian president is not allowed to stand for election in 2024. If there is indeed going to be a change of guard in the Kremlin in 2024, according to the common practice in Russia, the successor will already take office as acting Presi­dent even earlier, before the presidential election takes place. The political poker for Putin’s succession could begin early, and a series of measures undertaken since 2016, such as the reappointment of officials to important positions within the Kremlin adminis­tration can already be understood as part of this pro­cess. The stakes are high, and the struggles around who will fill these positions can be expected to lead to new conflicts within the Russian elite. Against this backdrop, there can be little hope that the Kremlin will push forward with politically diffi­cult economic reforms that could ultimately lead to diversification and sustainable development of the Russian economy. In view of the demographic bur­dens and the uncertainty regarding new US sanctions, ongoing economic stagnation is more likely, which could increasingly undermine the legitimacy of the regime. The Kremlin recently dealt with this problem by increasing repression and intensifying its control over the media and social networks. When faced with economic difficulties in the past, the Russian leadership has also used anti-Western propaganda as an alternative strategy of legitimization. If dissatisfaction within the Russian population increases, heightened foreign policy confrontation with the USA and EU could benefit the Kremlin. The tightening in Russia’s financial situation could also have negative impacts on the region’s stability: If Russia discontinues its substantial subsidies to several neighboring countries (particularly Belarus), these coun­tries could find it less appealing to main­tain politi­cal and economic ties with Russia. At the same time, the Russian leadership is unlikely to relinquish its hegemonial claims. To compensate for its declining economic appeal, Russia could turn to other instruments of political power. One possibility would be the military;134 others could include tough economic measures and trade sanctions or increased pressure on guest workers. In the area of economic policy, just as in foreign policy, the Russian leadership has focused recent efforts on isolating itself to an increasing degree from the EU. The Kremlin took Western sanctions as an occasion to introduce a wide-ranging program of import substitution, including an import embargo that also affected German exports to Russia. The pro­tectionism applies primarily to trade, however, and less to investments: The Russian government recently intensified its efforts to induce foreign manu­facturers to move production to Russia. In its “special investment contracts” (“SpetsInvestKontrakt”) it promises privileges and stable long-term conditions. Germany and the EU have few options at their disposal to influence Russian domestic and economic policy developments in the near term. This is due, on the one hand, to the current tense relationship with Russia and mutual economic sanctions, and on the other, to the Russian regime’s course of action over the last decade, which has been to systematically cut itself off from Western influences. For this reason, above all, Germany and the EU should follow their own long-term strategic perspec­tive. Diversification of the Russian economy, for in­stance, is not just in the economic but also in the security policy interest of the EU. With a diversified economy that is integrated into international supply chains, Russia is likely to develop a stronger national interest in the stability of international rules. The risks to the stability of the system would be lower in Russia if the government were less dependent on volatile oil and gas revenues. Due to Russia’s role in the crisis in Ukraine, the EBRD received instructions in July of 2014 not to fund any further investment projects in Russia. This deci­sion is not part of the EU Council decisions on the Russian sectoral economic sanctions, which were tied to the implementation of the Minsk agreement.137 The EBRD could thus resume its work again without the conditionality of the economic sanctions being undermined. Precisely because of the EBRD’s unique orientation, it would be beneficial to a strategic for­eign policy towards Russia for the EBRD to begin funding projects in Russia again. Furthermore, the significant interest on the part of the Russian leadership in attracting foreign manu­facturers to Russia provides an opportunity to expand economic cooperation in the direction of long-term diversification. The large number of new investment projects in Russia shows that German companies are clearly interested in Russian investment agreements, despite the difficulties that import substitution creates. Although foreign investors in Russia cannot be expected to have an immediate transformative impact in the sense of “change through rapprochement”, the investments could at least help to create conditions that would allow Russia to begin moving toward a less oil-dependent future. Note: Data on years marked with an * are based on Russian budget planning for the period 2018–2020. **Includes federal transfers to regional budgets. Up to 2010, pension fund transfers were also included. At the end of May 2018, a new budget bill was introduced in the Russian Duma taking the sharply increased oil price from 2018 into account. between levels of government. Data on years marked with an * are based on Russian budget planning for the period 2018–2020. All budget data are taken from the Russian Finance Ministry’s official statistics, Minfin Rossii, Finansovo-ėkono­micheskie pokazateli Rossijskoj Federacii [Financial and economic indicators of the Russian Federation], https://www.minfin.ru/ ru/statistics/. Data on GDP come from: Rosstat, Valovoj vnu­trennij produkt [Gross Domestic Product], http://www.gks.ru/ free_doc/new_site/vvp/vvp-god/tab3.htm (both accessed 2 February 2018). See Appendices A and B, p. 42 and 43. To convert ruble amounts, we used the average exchange rate for 2017 (€1 is equivalent to 65.94 rubles), “Euro (EUR) to Russian Ruble (RUB) Average Annual Exchange Rate 1999–2017”, Statista (online), 2018, http://www.statista. com/statistics/412824/euro-to-ruble-average-annual-exchange-rate/ (accessed 27 March 2018). International Monetary Fund (IMF), Russian Federation: Fiscal Transparency Evaluation, IMF Country Report 14/134 (Washington, D.C., May 2014), https://www.imf.org/external/ pubs/ft/scr/2014/cr14134.pdf (accessed 30 December 2017); Alexander Abramov, Alexander Radygin and Maria Cher­nova, “State-Owned Enterprises in the Russian Market. Ownership Structure and their Role in the Economy”, Russian Journal of Economics 3, no. 1 (2017): 1–23. A frequently used threshold value in the literature is 40 percent, see Giacomo Luciani, “Allocation vs. Production States. A Theoretical Framework”, in The Arab State, ed. Gia­como Luciani (Berkeley, 1990), 70. IMF, Revenue Administration. Administering Revenues from Natural Resources – A Short Primer (Washington, D.C., July 2014), 4. Stefan Wagstyl, “Russia: Riding with the Rentiers”, Finan­cial Times, 8 July 2011, https://www.ft.com/content/ab44f357-5e42-3ecd-a96f-415bbd42db08 (accessed 26 March 2018). The price of Urals, the reference oil brand used for pricing Russian oil, Minfin Rossii, O srednej cene nefti marki Urals po itogam janvarja – dekabrja 2017 goda [on the average price of Urals oil from January–December 2017], 14 Febru­ary 2018, https://www.minfin.ru/ru/press-center/?id_4=34979 (accessed 12 March 2018). Alexander Libman, Russische Regionen. Sichere Basis oder Quelle der Instabilität für den Kreml?, SWP-Studie 19/2016 (Ber­lin: Stiftung Wissenschaft und Politik, November 2016), 13. At the end of 2017, regional debt was 2.1 trillion rubles (€31.8 billion). Data on regional debt are published in “Gosu­darstvennyj dolg sub”ektov RF” [Public debt of Russian fed­eral subjects], iMonitoring, 1 March 2018, http://iminfin.ru/ areas-of-analysis/budget/gosudarstvennyj-dolg-sub-ektov-rf? territory=14000000 (accessed 27 March 2018). According to estimates by Fitch Ratings, Claudia Car­penter, “Kuwait Is Best Off, Nigeria Worst in Fitch’s 2017 Oil Break-Even”, Bloomberg, 6 April 2017, https://www. bloomberg.com/news/articles/2017-04-06/kuwait-is-best-off-nigeria-worst-in-fitch-s-2017-oil-break-even (accessed 20 De­cember 2017). Rosstat, Valovoj vnutrennij produkt (see note 1). World Bank Group, Global Economic Prospects. Broad-Based Upturn, but for How Long?, (Washington, D.C., 2018), 4. Ibid. ; Abramov, Radygin and Chernova, “State-Owned Enterprises” (see note 3). World Bank Group, Searching for a New Silver Age in Russia. The Drivers and Impacts of Population Aging, (Washington, D.C., 2015), 10.
demography/# (accessed 2 February 2018). Vladimir Ruvinskij and Marija Zheleznova, “Krugi rossijskoj toksichnosti. Kak daleko mogut zajti posledstvija novych amerikanskich sankcij” [Ripple effects of Russian toxicity. How far the impacts of the new American sanctions can go], Vedomosti, 29 October 2017, https://www.vedomosti. ru/opinion/articles/2017/10/30/739760-krugi-toksichnosti (accessed 23 January 2018). Minfin Rossii, Gosudarstvennyj dolg [Public Debt], 9 Janu­ary 2018, https://www.minfin.ru/ru/perfomance/public_debt/ (accessed 26 January 2018). IMF, Russian Federation: Fiscal Transparency Evaluation (see note 3). Inna Grigor’eva, “Dolju gosudarstva v bankach chotjat ogranichit’” [State ownership in banks is to be limited], Banki.ru, 20 October 2017, http://www.banki.ru/news/ bankpress/?id=10070588 (accessed 26 January 2018). Andrey Movchan, “How to Fix Russia’s Broken Banking System”, Financial Times, 14 January 2018, https://www.ft. com/content/b90754a8-f7c0-11e7-a4c9-bbdefa4f210b (accessed 15 January 2018). Bank Rossii, Vneshniy dolg Rossijskoj Federacii [Foreign debt of the Russian Federation], http://www.cbr.ru/statistics/ credit_statistics/debt/debt_new.xlsx (accessed 6 August 2018). Eugene Goryunov et al., Russia’s Fiscal Gap, NBER Working Paper 19608 (Cambridge, MA: National Bureau of Eco­nomic Research, November 2013). To calculate fiscal debt, all future government spending is deducted from all future tax revenues (at the respective current prices). For international comparability, this value is expressed as a percentage of future GDP (at current prices). Evgeny Goryunov, Lawrence Kotlikoff and Sergey Sinel­nikov-Murylev, “The Fiscal Gap. An Estimate for Russia”, Rus­sian Journal of Economics 1, no. 3 (2015): 250–51. World Bank Group, Balancing Economic Adjustment and Transformation, Russia Economic Report 34 (Washington, D.C., 2015), 46. IMF, Fiscal Monitor, October 2013. Taxing Times (Washing­ton, D.C., October 2013), 81. Ibid. ; World Bank Group, Balancing Economic Adjustment and Transformation (see note 25). On Belgian government revenue, see Economist Intelligence Unit, Belgium. Annual Data and Forecast, https:// country.eiu.com/article.aspx?articleid=1866770970&Country=Belgium (accessed 8 June 2018). On Russian revenue, see Minfin Rossii, Finansovo-ėkonomicheskie pokazateli Rossijskoj Federacii (see note 1). Pravitel’stvo Rossii, Zasedanie Pravitel’stva 7 December 2017 [Meeting of the Government, 7 December 2017], http:// government.ru/news/30441/ (accessed 26 January 2018). Dmitry Butrin, “Bjudzhetnoe pravilo 4.0” [Budget rule 4.0], Kommersant, 6 June 2017, https://www.kommersant.ru/ doc/3318593 (accessed 6 June 2017). Sergej Titov, “Putin prizval vvesti moratorij na izmene­nie nalogovoj nagruzki” [Putin called for a moratorium on the change in the tax burden], Vedomosti, 4 December 2014, https://www.vedomosti.ru/finance/articles/2014/12/04/putin-prizval-vvesti-moratorij-na-izmenenie-nalogovoj (accessed 31 December 2017). “Perenos ubytkov v 2017 godu” [Loss carried forward in 2017], Buchgalterija.ru, 17 January 2017, http://www. buhgalteria.ru/article/n154921 (accessed 24 August 2017). Elizaveta Bazanova, “Pochti 100 mlrd rublej zarabota­jut regiony na nalogovych izmenenijach” [Regions to gain almost 100 billion rubles through tax changes], Vedomosti, 2 March 2017), https://www.vedomosti.ru/economics/ articles/2017/03/02/679613-zarabotayut-regioni-nalogovih-izmeneniyah (accessed 24 August 2017). Fares Kil’zie, “NDPI: differencirovat’, a ne podnimat’” [NDPI (= extraction taxes): Differentiate, don’t raise], Vedo­mosti, 10 March 2016, https://www.vedomosti.ru/opinion/ articles/2016/03/10/632959-ndpi (accessed 1 September 2017). Yuri Barsukov, “V bjudzhet dol’jut benzina. Neftjaniki chotjat razdelit’ nalogovoe bremja s potrebiteljami” [The budget is being filled up with gas], Kommersant, 15 September 2016, https://www.kommersant.ru/doc/3089123 (accessed 28 January 2018). Ol’ga Mordjushenko, “Dorogie akcizy – regulirovanie rynka” [High excise taxes – market regulation], Kommersant, 14 April 2016, https://www.kommersant.ru/doc/2962740 (accessed 31 August 2017). 695653-rubl-putina (accessed 30 August 2017). All relative figures refer to changes in spending relative to GDP. A theoretical discussion of the connection between social policy and regime stability can be found in Franziska Smolnik, Sozialpolitik und Regimestabilität im Südkaukasus. Das Beispiel Rentenreform, SWP-Studie 10/2017 (Berlin: Stiftung Wissenschaft und Politik, May 2017). The Gini coefficient of income is 0.49 for market incomes, 0.30 after redistribution, World Bank Group, The Russian Economy Inches Forward. Will that Suffice to Turn the Tide? Russia Economic Report 36 (Washington, D.C., November 2016). Evsej Gurvich and Juliya Sonina, “Mikroanaliz rossijskoj pensionnoj sistemy” [Microanalysis of the Russian pension system], Voprosy ėkonomiki, no. 2 (2012): 27–51. Anna Mogilevskaya, Anton Fejnberg and Ivan Tkachëv, “Neformal’naya ėkonomika v Rossii vyrosla do rekordnych razmerov” [Informal economy in Russia grew to record level], RBC, 17 April 2017, https://www.rbc.ru/economics/17/04/ 2017/58f4b8789a7947c1418ff1af (accessed 26 January 2018). Tax policy faces a very similar problem: a more progresssive income tax could create a fairer distribution of the tax burden. But introducing such a tax would entail the risk that the informal sector of the economy could continue to grow; see World Bank Group, The Russian Economy Inches Forward (see note 41), 35. Luis F. López-Calva, Nora Lustig, Mikhail Matytsin et al., “Who Benefits from Fiscal Redistribution in the Russian Fed­eration?”, in The Distributional Impact of Taxes and Transfers. Evi­dence from Eight Low- and Middle-Income Countries, ed. Gabriela Inchauste and Nora Lustig (Washington, D.C.: World Bank Group, 2017), 223. “VCIOM: 70% oproshennych rossijan zayavili, chto namereny prijti na vybory prezidenta RF” [WCIOM: 70 per­cent of Russians surveyed stated that they are planning to vote in the RF presidential election], TASS, 20 December 2017, http://tass.ru/obschestvo/4826581 (accessed 27 March 2018). “Vybory v Moskve i Ekaterinburge: kto planiroval i kto prishel?” [Elections in Moscow and Yekaterinburg: Who planned to come and who came? ], WCIOM (online), 25 Sep­tember 2013, https://wciom.ru/index.php?id=236&uid= 114510 (accessed 27 March 2018). Calculations by author based on the budget of the pension fund, Minfin Rossii, Finansovo-ėkonomicheskie pokazateli Rossijskoj Federacii (see note 1), and the evolution of employment figures: Rosstat, Demografija (see note 15). Assumption: pension payments and contributions develop proportionally to the population and GDP growth. “Putin rasskazal o svoem soprotivlenii povysheniju pen­sionnogo vozrasta” [Putin expressed his resistance to the in­crease in the retirement age], RBC, 17 December 2015, https:// www.rbc.ru/rbcfreenews/56729d879a794709f72589e6 (accessed 28 January 2018). Janis Kluge, Kremlin Launches Risiky Pension Reform. Plan to Raise Retirement Age Undermines Confidence in Russian Leadership, SWP Comment 28/2018 (Berlin: Stiftung Wissenschaft und Politik, July 2018). Linda J. Cook, “Russia’s Welfare Regime: The Shift toward Statism”, in Gazing at Welfare, Gender and Agency in Post-Socialist Countries, ed. Maija Jäppinen et al. (Newcastle upon Tyne, 2011), 14–37. Irina Petrakova and Vadim Biserov, “L’gotniki sozhgli Putina” [Benefit recipients burned Putin], gazeta.ru, 28 Feb­ruary 2005, https://www.gazeta.ru/2005/02/28/oa_149600. shtml (accessed 19 December 2017). “Rejting Putina upal do istoricheskogo minimuma” [Putin’s approval rating fell to historic low], Lenta.ru, 7 July 2005, https://lenta.ru/news/2005/07/07/rating/ (accessed 28 January 2018). Elena Iarskaia-Smirnova, Daria Prisyazhnyuk and Rostis­lav Kononenko, “Representations of Inequality and Social Policy in the Russian Official Press, 2005–2012”, Journal of European Social Policy 26, no. 3 (2016): 268–80. On Russia, see also Alfio Cerami, “Welfare State Devel­opments in the Russian Federation. Oil-led Social Policy and ‘The Russian Miracle’”, Social Policy & Administration 43, no. 2 (2009): 105–20; Andreas Heinrich and Heiko Pleines, “Ana­lyse: Die politischen Herausforderungen eines Erdölbooms: Ressourcenfluch und politische Stabilität in Russland” [Analysis: The political challenges of a natural gas boom: resource curse and political stability in Russia], Russland-Ana­lysen, no. 240 (2016): 7–13. On regime legitimization in rentier states: Kevin M. Morrison, “Oil, Nontax Revenue, and the Redistributional Foundations of Regime Stability”, Inter­national Organization 63, no. 1 (2009): 107–38; Uriel Abulof, “‘Can’t Buy Me Legitimacy’. The Elusive Stability of Mideast Rentier Regimes”, Journal of International Relations and Develop­ment 20, no. 1 (2017): 55–79. World Bank Group, The Russian Economy Inches Forward (see note 41). This effect became more pronounced with the floating of the ruble course in November 2014. Ol’ga Kuvshinova and Aleksandra Prokopenko, “Den’gi na razovuyu vyplatu pensioneram eshche predstoit najti” [Money still has to be found for one-time payment to pen­sion recipients], Vedomosti, 24 August 2016, https://www. vedomosti.ru/economics/articles/2016/08/24/654249-deneg-indeksatsiyu-pensii-budut-iskat-razovuyu-viplatu (accessed 25 August 2017). Marina Khmelnitskaya, “The Social Budget Policy Pro­cess in Russia at a Time of Crisis”, Post-Communist Economies 29, no. 4 (2017): 468. Natalija Bijanova, “Chastnye pensionnye fondy mogut poluchit’ den’gi byvshich molchunov” [Private pension funds could receive money from the former ‘silent’ (= pension con­tributors who did not state which pension funds should receive their contributions)], Vedomosti, 8 October 2015, https://www.vedomosti.ru/finance/articles/2015/10/08/612034-chastnie-pensionnie (accessed 25 August 2017). Alina Evstigneeva, “Moratorij po umolchaniju” [Implicit moratorium], Izvestiya, 2 August 2017, https://iz.ru/627023/ alina-evstigneeva/moratorii-na-pensionnye-nakopleniia-prodliat-do-2021-goda (accessed 25 August 2017). On implicit debt, see Ognian Hishow, Die implizite öffent­liche Schuld. Schuldenproblem “plus” der Europäischen Union, SWP-Studie, 25/2010 (Berlin: Stiftung Wissenschaft und Politik, October 2010). The measure reduces the demand for long-term investment and increases the costs of financing invest­ments. Satisfaction levels increased again in 2017, but the more recent figures are difficult to compare with past figures due to a change in survey methodology. Current data can be found in “Ocenka vlastej” [Evaluation of the authorities], WCIOM (online), https://wciom.ru/news/ratings/ocenka_ vlastej/ (accessed 27 March 2018). Andrej Kamakin, “Novyj srok Putina budet ochen’ tja­zhelym dlja nego i strany” [New term of office will be diffi­cult for Putin and for the country], Moskovskiy Komsomolec, 25 January 2018, http://www.mk.ru/politics/2018/01/25/novyy-srok-putina-budet-ochen-tyazhelym-dlya-nego-i-strany.html (accessed 28 January 2018). SIPRI, SIPRI Definition of Military Expenditure, https://www. sipri.org/databases/milex/definitions (accessed 2 February 2018). Margarete Klein, Russlands Militärpotential zwischen Groß­machtanspruch und Wirklichkeit. Zustand, Reformen und Entwicklungsperspektiven der russischen Streitkräfte [Russia’s military potential between superpower aspirations and reality. Con­dition, reforms, and development perspectives of the Russian armed forces], SWP-Studie 24/2009 (Berlin: Stiftung Wissenschaft und Politik, October 2009). Dmitri Trenin, “The Revival of the Russian Military. How Moscow Reloaded”, Foreign Affairs 95, no. 3 (2016): 23–29. Andrzej Wilk, “A Significant Pay Increase in the Russian Army”, Ośrodek Studiów Wschodnich (online), 1 February 2012, https://www.osw.waw.pl/en/publikacje/analyses/2012-02-01/a-significant-pay-increase-russian-army (accessed 9 October 2017). Ivan Safronov and Dmitrij Butrin, “Vooruzheniya vstu­pili v boj s vozrazheniyami” [Arms in the struggle against objections], Kommersant, 19 February 2015, https://www. kommersant.ru/doc/2670562 (accessed 28 January 2018). “Putin provedet zasedanie voenno-promyshlennoj komissii” [Putin leads meeting of the military-industrial commission], RIA Novosti, 19 September 2017, https://ria.ru/ defense_safety/20170919/1505029454.html (accessed 9 Octo­ber 2017). Richard Connolly and Cecilie Sendstad, “Russian Re­arma­ment. An Assessment of Defense-Industrial Performance”, Problems of Post-Communism 65, no. 3 (2018): 143–60. Safronov and Butrin, “Vooruzheniya vstupili v boj s voz­razheniyami” (see note 69). Susanne Oxenstierna, “Russia’s Defense Spending and the Economic Decline”, Journal of Eurasian Studies 7, no. 1 (2016): 60–70. Anna Eremina, Aleksandra Prokopenko and Tat’jana Voronova, “Dosrochnye vyplaty po kreditam na oboronzakaz prinesut bankam 800 mlrd i golovnuju bol’“ [Early repay­ment of loans for arms contracts costs banks 800 billion and causes headaches], Vedomosti, 14 December 2016, https:// www.vedomosti.ru/finance/articles/2016/12/14/669471-dosroch noe-pogashenie-golovnuyu-bol (accessed 6 October 2017). Una Hakvåg, “Russian Defense Spending after 2010. The Interplay of Personal, Domestic, and Foreign Policy Inter­ests”, Post-Soviet Affairs 33, no. 6 (2017): 496–510. Konstantin Gaaze, Gibrid ili diktatura – 2. Kak slozhilas’ koaliciya vojny Vladimira Putina [Hybrid or dictatorship – 2. How Putin’s coalition of war emerged] (Moscow: Carnegie Moscow Center, May 2015), http://carnegie.ru/commentary/ ?fa=69995 (accessed 5 June 2017). zavoda_pro_nachalo_samogo (accessed 9 February 2018). Gaidar Institute, Russian Economy in 2016. Trends and Out­looks (Moscow, 2017), 468, https://iep.ru/files/text/trends/2016-eng/Book.pdf (accessed 1 June 2017). Centr ėkonomicheskogo razvitija i sertifikacii, OPK: ternistyj put’ k diversifikacii [Military-industrial complex: Rocky path to diversification], 12 September 2016, https://profiok. com/about/news/detail.php?ID=3349&sphrase_id=5523 (accessed 2 February 2018). Roman Ryskal’, “Oboronka gotovitsja k potrebleniju” [Arms industry prepares for consumption], Kommersant, 26 May 2017, https://www.kommersant.ru/doc/3307198 (accessed 2 February 2018). Julian Cooper, Prospects for Military Spending in Russia in 2017 and beyond (Birmingham, March 2017), https:// www.birmingham.ac.uk/Documents/college-social-sciences/ government-society/crees/working-papers/prospects-for-military-spending-in-Russia-in-2017-and-beyond.pdf (accessed 2 October 2017). Siemon Wezeman, “China, Russia and the Shifting Land­scape of Arms Sales”, SIPRI (online), 5 July 2017, https://www. sipri.org/commentary/topical-backgrounder/2017/china-russia-and-shifting-landscape-arms-sales (accessed 10 October 2017). publications/research/2017-03-20-russia-arms-exporter-connolly-sendstad.pdf (accessed 30 April 2018). Aleksandr Trushin, “‘Voennaya nagruzka stala tormo­zom’” [Defense burden became a brake], Kommersant, 17 October 2016, https://www.kommersant.ru/doc/3114479 (accessed 2 February 2018). Svetlana Bocharova and Aleksej Nikol’skij, “Putin soob­shchil o prinjatii novoj gosprogrammy vooruzhenij” [Putin reported on the adopotion of the new state armament pro­gram], Vedomosti, 24 January 2018, https://www.vedomosti.ru/ economics/articles/2018/01/24/748864-putin-vooruzhenii (accessed 2 February 2018). Madalina Sisu Vicari and Nicholas Trickett, CAATSA Out of the Bag: Russia’s Arms Exports under Threat (Philadelphia: Foreign Policy Research Institute, 2018), https://bearmarket brief.com/2018/01/23/the-caatsa-out-of-the-bag-russias-arms-exports-under-threat/ (accessed 28 January 2018). Alina Didkovskaya, “Al’fa-bank prekratit sotrudnichat’ s oboronnymi predprijatijami iz-za sankcij” [Alfa Bank stops doing business with arms manufacturers due to sanctions], Vedomosti, 3 January 2018, https://www.vedomosti.ru/ finance/articles/2018/01/03/747066-alfa-bank (accessed 2 Feb­ruary 2018). Max Seddon, “Moscow Creates Bank to Help It Avoid US Sanctions”, Financial Times, 19 January 2018, https://www. ft.com/content/90c73fe4-fd15-11e7-9b32-d7d59aace167 (ac­cessed 28 January 2018). Under the internationally oriented businessman Boris Titow, the Stolypin Club has moved away from some of the nationalist ideas of previous head Sergey Glasyev, see Roland Götz, “Die Wirtschaftspolitik der belagerten Festung. Das Glasjew-Programm” [The economic policy of the besieged fortress. The Glazyev program], Russland-Analysen, no. 305 (2015), 6–11, http://www.laender-analysen.de/russland/ pdf/RusslandAnalysen305.pdf (accessed 2 February 2018). Alexey Kudrin and Alexander Knobel, “Bjudzhetnaya politika kak istochnik ėkonomicheskogo rosta” [Budget policy as a source of economic growth], Voprosy ėkonomiki 26, no. 10 (2017). Alexey Kudrin, “Bjudzhetnyj manevr i strukturnaya perestrojka rossijskoj ėkonomiki” [The budget maneuver and structural reform of the Russian economy], Voprosy ėkonomiki 26, no. 9 (2017). Andrey Ostroukh, “World Bank Urges Russia to Spend More on Healthcare, Education”, Reuters, 16 January 2018, https://uk.reuters.com/article/us-worldbank-russia/world-bank-urges-russia-to-spend-more-on-healthcare-education-idUKKBN1F529F (accessed 2 February 2018). Boris Titov and Aleksandr Shirov, “Strategija rosta dlja Rossii” [Strategy of growth for Russia], Voprosy ėkonomiki 26, no. 12 (2017). Institut ėkonomiki rosta im. Stolypina P.A., Rol’ voenno-promyshlennogo kompleksa v obespechenii ėkonomicheskogo rosta v RF [The role of the military-industrial complex in ensuring economic growth in the RF] (Moscow, November 2017), http://stolypinsky.club/2017/11/22/issledovanie-instituta-ekonomiki-rosta-rol-oboronno-promyshlennogo-kompleksa-v-obespechenii-ekonomicheskogo-rosta-v-rf/ (accessed 1 Feb­ruary 2018). Vesti Finance, “Putin ocenil strategii Kudrina i Titova. Chto dal’she?” [Putin evaluated the strategies of Kudrin and Titov. Where do we go from here? ], Vesti Finance, 31 May 2017, http://www.vestifinance.ru/articles/86115 (accessed 5 January 2018). “Presidential Address to the Federal Assembly”, Kremlin.ru, 1 March 2018, http://en.kremlin.ru/events/president/news/ 56957 (accessed 30 April 2018). Ben Noble, “Amending Budget Bills in the Russian State Duma”, Post-Communist Economies 29, no. 4 (2017): 505–22. Thomas Remington, “Patronage and the Party of Power. President-Parliament Relations under Vladimir Putin”, Europe-Asia Studies 60, no. 6 (2008): 959–87. Aside from United Russia, only the nationalist “liberal-democratic party” voted in favor of the current budget law for 2018–2020, Vadim Visloguzov, “Bjudzhet povyshennoj prochnosti” [Budget of increased stability], Kommersant, 28 October 2017, https://www.kommersant.ru/doc/3453712 (accessed 5 January 2018). Stephen Fortescue, “Russian Federal Budget Formation. Introduction”, Post-Communist Economies 29, no. 4 (2017): 453. The Russian elite is also often differentiated into the “Silo­viki” (Ministry of Internal Affairs, Secret Service, and Mili­tary) and the “liberals”. This differentiation focuses on the distinguishing ideological orientation and typical career paths of each group, while the term “bloc” is used to refer to the official roles of the various government agencies. Titov, “Putin prizval vvesti moratorij na izmenenie nalogovoj nagruzki” (see note 31). Stephen Fortescue, “The Role of the Executive in Rus­sian Budget Formation”, Post-Communist Economies 29, no. 4 (2017): 523–37. The most recent example was the cancellation of tax debts, new social benefits for mothers on the birth of their first child, and measures to reduce gas prices. An example is the discussion on the use of pension contributions, see Thomas Remington, Pension Reform in Authoritarian Regimes: Russia and China Compared (Atlanta, July 2015), http://www.polisci.emory.edu/home/documents/ papers/pension-reform-%20authoritarian-regimes.pdf (ac­cessed 9 October 2017). Aleksandra Prokopenko, “Novye pravila bjudzheta” [New budget rules], Vedomosti 19 October 2016, https://www. vedomosti.ru/opinion/articles/2016/10/19/661524-novie-pravila (accessed 21 October 2017). International Budget Partnership, Open Budget Index 2015, https://www.internationalbudget.org/wp-content/ uploads/OBS2015-OBI-Rankings-English.pdf (accessed 2 Janu­ary 2018). On Russia’s individual ranking, see International Budget Partnership, Open Budget Survey 2015 – Russia, https:// www.internationalbudget.org/wp-content/uploads/OBS2015-CS-Russia-English.pdf (accessed 2 January 2018). Confidentiality can be used to avoid critical discussions among political actors about expenditures. For Russian civil servants, there are also strong personal incentives to expand confidentiality: Employees of Russian agencies that work with confidential information receive salary increases of as much as 75 percent; see Julian Cooper, “The Russian Budgetary Process and Defence. Finding the ‘Golden Mean’”, Post-Communist Economies 29, no. 4 (2017): 483. IMF, Russian Federation: Fiscal Transparency Evaluation (see note 3), 33. Gaidar Institute, Russian Economy in 2016. Trends and Out­looks (see note 78), 469. 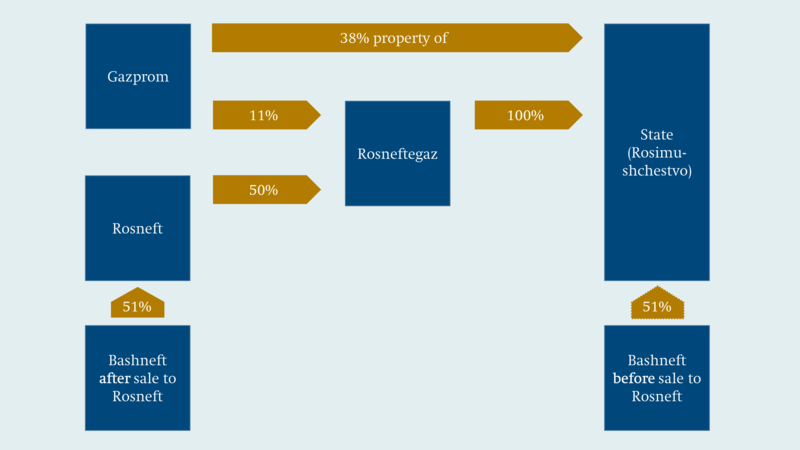 See the following section on Rosneftegaz. Ivan Tkachëv, “Oboronnyj trillion: v bjudzhete sozda­dut rezerv na ‘otdel’nye meroprijatija’” [Defense trillion: A reserve for “special measures” introduced into the budget], RBC, 18 September 2017, https://www.rbc.ru/economics/18/09/ 2017/59bff3cf9a794710a9300d17 (accessed 2 February 2018). Viktor Kessler, Die sichtbare Hand des Staates. Eine rechts­ökonomische Analyse russischer Staatskorporationen, Schriften­reihe zum Osteuropäischen Recht 19 (Berlin, 2013), 326. In some cases, there are stricter laws applying to state corporations depending on the acts of incorporation and form of financing, see ibid. Carsten Sprenger, “State Ownership in the Russian Economy. Its Magnitude, Structure and Governance Problems”, Journal of Institute of Public Enterprise 33, no. 1–2 (2010). Aleksandr Branis, “Otdajte dividendy!” [Pay out the dividends! ], Vedomosti, 1 March 2017, https://www.vedomosti. ru/opinion/articles/2017/03/02/679573-otdaite-dividendi (ac­cessed 2 February 2018). Schetnaya Palata, Zakljuchenie Schetnoj palaty Rossijskoj Federacii na proekt federal’nogo zakona № 185935-7 [Conclusions of the Russian Accounts Chamber on draft federal law no. 185935-7] (Moscow, 2017), http://audit.gov.ru/activities/ audit-of-the-federal-budget/30381/ (accessed 8 August 2017). Margarita Papchenkova, Elizaveta Bazanova and Ol’ga Petrova, “Minfin prodolzhaet bor’bu za dividendy goskom­panij” [Finance ministry continues battle over dividends in state-owned companies], Vedomosti, 10 July 2017, https:// www.vedomosti.ru/economics/articles/2017/07/10/717277-minfin-dividendi (accessed 3 January 2018). On Rosneft, see Hans-Henning Schröder, “Der Mineral­ölkonzern ‘Rosneft’. Kommerzieller Erfolg und Einsatz poli­tischer Machtmittel” [The mineral oil corporation Rosneft. Commercial success and the use of instruments of political power], Russland-Analysen, no. 348 (2018): 9–16. “Chronika slijanija“ [Timeline of the merger], Kommersant, 3 March 2005, https://www.kommersant.ru/doc/551982 (accessed 2 February 2018). Dmitrij Kozlov, “Rukovodstvo ‘Rosneftegazom’ doverili ėks-ministru” [Former minister entrusted with leadership of Rosneftegaz], Kommersant, 3 June 2016, https://www. kommersant.ru/doc/3005490 (accessed 5 February 2019). “‘Rosneftegaz’ poluchil pravo skryvat’ o sebe infor­maciju” [Rosneftegaz gains right to keep company infor­mation confidential], Interfax, 18 March 2016, http://www. interfax.ru/business/499118 (accessed 5 January 2018). Margarita Papchenkova and Galina Starinskaya, “Finansy ‘Rosneftegaza’ zakryty poka i dlja pravitel’stva” [Rosneftegaz finances remain classified for the government], Vedomosti, 27 June 2017, https://www.vedomosti.ru/ economics/articles/2017/06/26/697334-finansi-rosneftegaza (accessed 2 January 2018). Margarita Papchenkova and Galina Starinskaya, “Polu­chit’ dochody ot ‘Rosneftegaza’ v bjudzhet, vozmozhno, ne poluchitsja” [May not be possible to obtain Rosneftegaz profits for the budget], Vedomosti, 25 October 2016, https:// www.vedomosti.ru/economics/articles/2016/10/25/662262-dohodi-rosneftegaza (accessed 2 January 2018). “Putin pojasnil, na kakie proekty pojdut den’gi ‘Ros­neftegaza’” [Putin explained which projects the Rosneftegaz money are going to], RIA Novosti, 23 December 2016, https:// ria.ru/economy/20161223/1484467582.html (accessed 17 August 2017). Papchenkova, Bazanova, and Petrova, “Minfin prodol­zhaet bor’bu za dividendy goskompanij” (see note 120). Part of the Alrosa shares were sold in 2016, Tat’jana Radchenko, Gosudarstvennoe uchastie v rossijskoj ėkonomike: gos­kompanii, zakupki, privatizacija [Government involvement in the Russian economy: state enterprises, procurement, pri­vatization], Bjulleten’ o razvitii konkurencii 13 (Moscow, 2016), http://ac.gov.ru/files/publication/a/8449.pdf (accessed 3 August 2017). Minfin Rossii, Osnovnye napravlenija bjudzhetnoj, nalogovoj i tamozhenno-tarifnoj politiki na 2018 god i planovyj period 2019 i 2020 godov [Fundamental directions of the budget, tax and customs tariff policy for the year 2018 and the planning periods 2019 and 2020] (Moscow, 2017). His successor in this position is former German Chan­cellor Gerhard Schröder. Roland Götz, “Ulyukayev Fall und Jewtuschenkows Niederlage. Rosnefts Expansion durch Annexion” [Ulyu­kayev’s fall and Yevtushenkov’s defeat. Rosneft’s expansion by annexation], Russland-Analysen, no. 348 (2018): 2–4, http:// www.laender-analysen.de/russland/pdf/RusslandAnalysen 348.pdf (accessed 5 February 2018). “Kudrin prizval k privatizacii vsech neftjanych akti­vov” [Kudrin called for privatization of all oil companies], Interfax, 1 June 2017, http://www.interfax.ru/forumspb/ 564758 (accessed 5 February 2018). See Margarete Klein, Russlands Militärpolitik im post­sowjetischen Raum [Russia’s military policy in the post-Soviet space], SWP-Studie 19/2018 (Berlin: Stiftung Wissenschaft und Politik, September 2018). European Bank for Reconstruction and Development (EBRD), The EBRD in Russia: Overview, https://www.ebrd.com/cs/ Satellite?c=Content&cid=1395238401543&pagename=EBRD%2FContent%2FContentLayout (accessed 27 March 2018). Stanislav Markus, “Secure Property as a Bottom-Up Process. Firms, Stakeholders, and Predators in Weak States”, World Politics 64, no. 2 (2012): 242–77. European Commission, European Union Restrictive Meas­ures (Sanctions) in Force, 2017, https://eeas.europa.eu/sites/eeas/ files/restrictive_measures-2017-08-04.pdf (accessed 27 March 2018).